This is my first time at MBS. After walking to and fro several times trying to find the way to access the Chocolate Bar, I must say that I should be rather familiar with the few towers. We were getting rather grouchy when pointed to different directions by the different staff and rejected access by a security guard. This is where we have to go in order to get to the Chocolate Bar. Stepping out of the lift at 57th floor, the wide expanse of Singapore's night scene instantly changed our mood. Once in the Chocolate Bar, we ordered our tea and coffee, then explored the display of desserts. Being not much of a dessert person, I carefully took my pick. 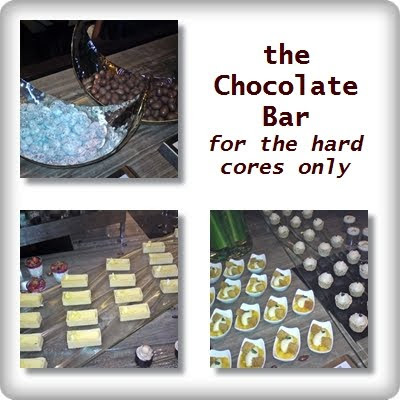 Combining sour stuff with sweet chocolate seems to help ease the richness. 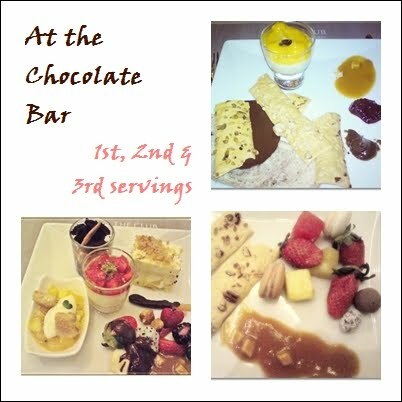 Perhaps I'm really not a chocolate fan, what I loved most are actually the thin crackers with passion fruit jam. This is the max I could go. Perhaps I could go further if these were served in the afternoon than at night. But I guess I would have to exercise much more to get rid of the excess calories.